Swimsuit season is here! And so are some of the worst looking swimsuits I have ever seen. Style. You either have it or you don’t. If you don’t have it, you can get it with time and practice. I must say however, if you are one of those males stuck in the style trial period of your life, if you are ever even the slightest bit unsure, stick to the basics. When I say the basics in regards to swimwear, I mean your basic neutral colors. 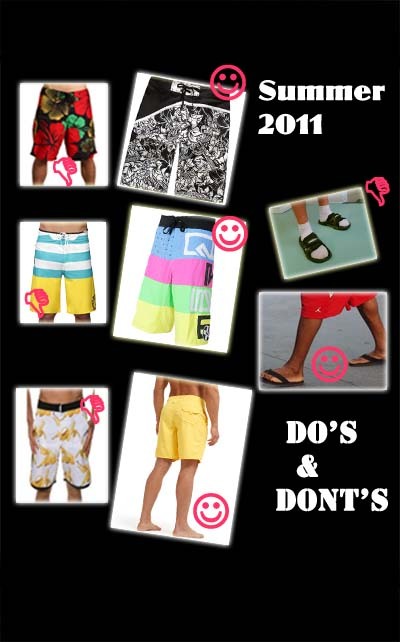 Don’t go for the baywatch piss yellow boardshorts or the black and white shorts that create a visual illusion. Remember EASY on the eyes. Sitting out at the pool in Vegas I couldn’t even begin to describe some of the ensembles I have seen. Here are some pointers or basic “red flags” to take into consideration when hanging by the pool “cooler than a polar bears toenails”. Do not wear socks (of any sort) with Nike shower shoes. If you only wear the Adidas, Nike or Jordan hydro sandals, make sure you don’t leave your room with socks on, and stay away from any of the crazy reds, blues and greens. Do not wear tennis shoes and socks with boardshorts and a wife eater. Unless you’re trying to pick up a girl that wears a one piece with hawaiian flowers and a ruffle over her derierre. Hawaiian print shorts of any kind not only make you look like you have been shopping at Big Lots but will scare the ladies away faster than bees in the summer. Try to stay away from wife beaters and board shorts. The combo looks like you are going to a white trash party. You might think that tight underwear looking shorts are attractive, especially when your package is on full display, but news flash; we don’t care. Can’t think of any other way to make a girl go running for the shade more. Again, we know you think bananas all over your board shorts is funny, and you hope to make that a trend, but really? Maybe if you’re 20….eh. The hair back then was ok, but I think you look beettr with black hair.Also I think you look much beettr now, in body and face.